. . .It's nothing but an old Owl. I forgot all about him. A fine soldier you are—afraid of an old Owl!" 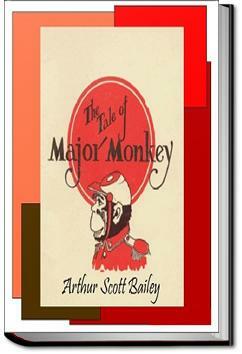 Major Monkey straightened his cap and looked as soldierly as he could. "You're mistaken, in a way," he told Mr. Crow. "I admit I was afraid. I was afraid I had frightened him, waking him up so suddenly. So I retreated." Old Mr. Crow stopped laughing and looked very thoughtful. It occurred to him that Major Monkey was a somewhat slippery person. Certainly he could slip[Pg 19] out of a hole about as easily as anybody Mr. Crow knew. "You'll have to find some other place for me to hide," the Major announced. "I don't want to stay in this tree all day, for I shouldn't like to disturb a gentleman's rest." Mr. Crow pondered for a few moments. "You see that old haystack?" he said at last, pointing across the fields. "Go and burrow under that. And be back here exactly an hour before sunset."